Last week, the US Senate passed the first appropriations bill for the 2017 budget, funding energy and water programs with $37.5 billion. 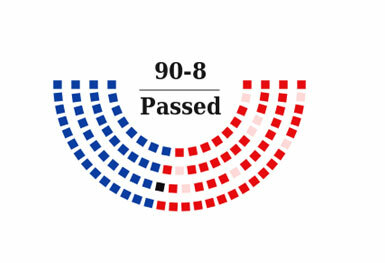 We’re surprised that it passed 90-8, given that it clearly prioritizes fossil and nuclear energy over renewables. President Obama threatens to veto it for that reason. Where are the Democrats on this???? “Funding at this level also would impede development of solutions to reduce U.S. dependence on oil and reduce energy waste, and undermine the Nation’s competitiveness in the future global clean energy economy,” the White House continues. Rep. Mike Simpson (R-ID) says the bill prioritizes defense, nuclear weapons priorities and fossil fuel R&D, while reining in President Obama’s out-of-bounds renewable energy agenda. It “rebalances the portfolio to provide a true all-of-the-above strategy. It includes strong funding for nuclear energy, providing research and development to ensure a safe, efficient, reliable nuclear fleet, and laying the foundation for the next generation of nuclear reactors. The one thing Democrats didn’t budge on was the attempt to undercut EPA’s Waters of the US rule by eliminating its funding. It restores protection for two million miles of streams and 20 million acres of wetlands, allowing it to safeguard drinking water supplies for a third of Americans, and for ecosystems. Calling it “massive overreach, it is currently on hold by a federal court. They also voted down an amendment from Sen. Dan Coats (R-IN) to wind down the Energy Department’s Advanced Vehicle Manufacturing Loan program. Rep. Nita Lowey (D-NY) says, “We cannot afford to bury our heads in the sand on climate change. And yet, the energy efficiency and renewable energy account would be funded at $248 million below the president’s request. An annual appropriations bill is not the place to amend or significantly change the Clean Water Act or restrict gun laws. These efforts year after year imperil the appropriations process. Compared to Obama’s 2017 budget, ARPA-E gets 16% less and EERE gets a 26% cut for renewable energy, 27% less for sustainable transportation and 20% less for energy efficiency. Obama’s budget doubles funding for clean energy R&D, as 20 nations promised to do under Mission Innovation at the Paris Climate Summit. And it includes the nation’s first carbon tax, which would fund a 21st century low-carbon transportation system. Read our article, What’s In Obama’s 2017 Budget: Energy & Environment, called “dead on arrival” by the Congressional majority. On the positive side, Obama supports the bill’s investments in restoring aquatic ecosystems and helping communities reduce the risk of floods – improving resilience against climate impacts. It meets his budget request for restoration of the Louisiana Coastal Area Ecosystem, Columbia River, South Florida Ecosystem, and Missouri River Fish and Wildlife Recovery.